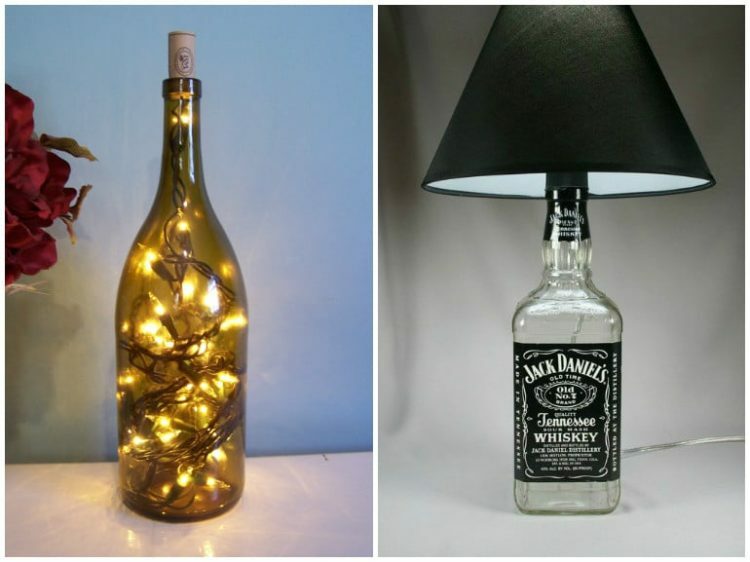 Welcome to this DIY bottle lamp tutorial! First, rest assured, it is actually easier than it sounds… Only simple electric skills and a good drilling tool are needed. 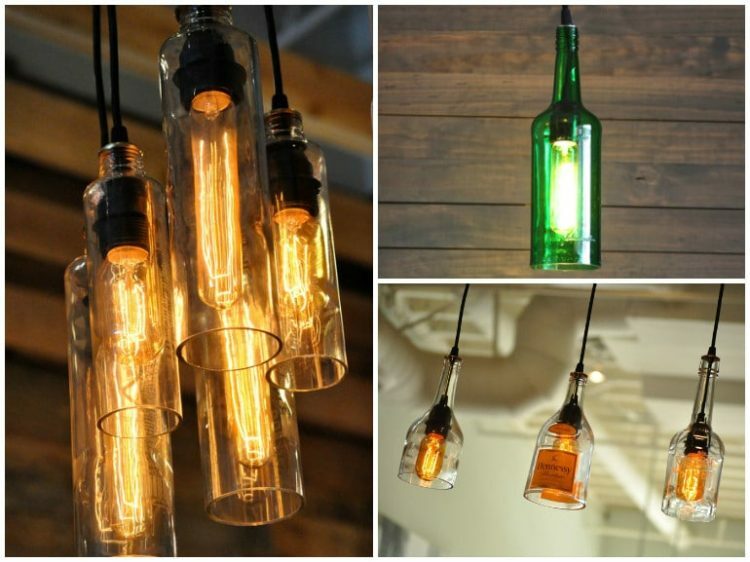 You can make two types of lamps with old bottles: pulley pendant light or desk lamp, the differences are the cutting/drilling of the bottle and the electrical equipment needed. An old or recycled glass bottle can be made with any two bottles of your choice, whether they be wine bottles or liquor bottles like Whiskey/Whisky/Scotch one (any brands, Scottish or Irish). A drilling tool with a diamond-tipped bit, Dremel one in this tutorial. 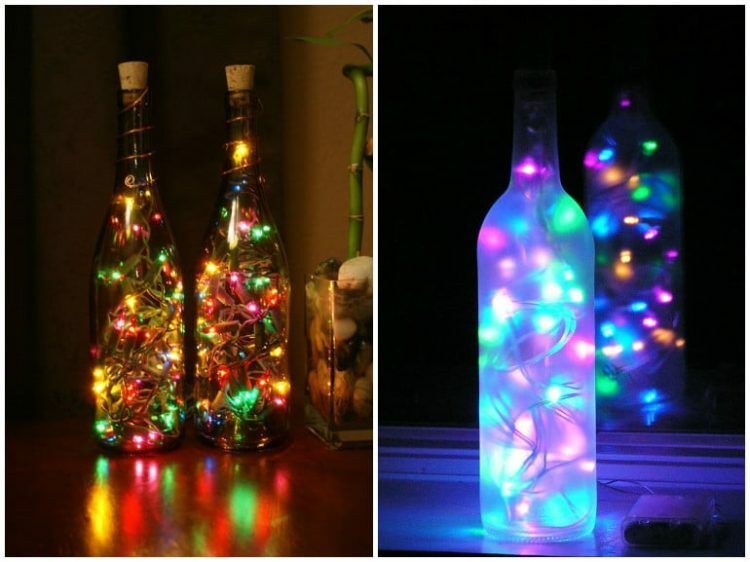 Electrical equipment: a short strand of Christmas lights (with a plug only on one end) or lamp shade with bottle adapter kit (or simple cork from the hardware store that fits the mouth of your bottle). Safety glasses and gloves (just in case the bottle breaks). First step: You will need to drill a hole at the bottom of your glass bottle. Most famous small drilling tools are Dremel Rotary Tool, we advise at least the 3000 Version in terms of performances. This tool can cut, carve, engrave, sand, grind, sharpen, clean and polish so you will find many ways to use it for others DIY experiences. You’ll also need a special diamond tip bit, Glass Drilling Bit is enough to drill glass bottles. Choose the right diameter and verify that the cord from your kit will fit through the hole. 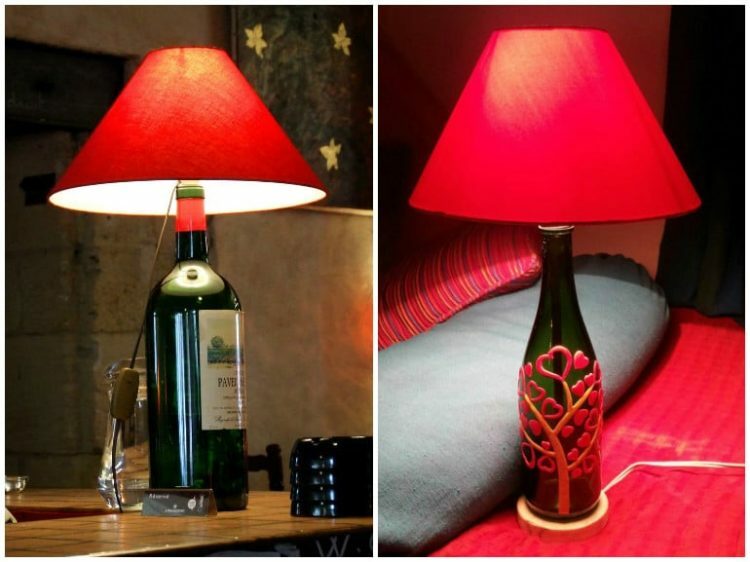 Apply your tape to the bottom of your bottle wherever you choose for the back of the lamp to be, make sure you leave as much space as possible between your hole and the base of the bottle or you may have a crack later. Ready to start drilling, you will need water, the water is to help keep the glass and the bit from overheating while you work, so the best place to work in is a sink. Rest the bottle on a towel in the sink to dampen vibration and start your hole. The tape should keep the drill from wandering around on the surface of the glass provided you start slowly. Run water over the contact point between the glass and drill as you work to lubricate the bit and minimize the risk of a crack developing. Make sure the drill is as close to vertical as you can get it and maintain your drill speed, start out very slowly and gradually increase the speed (the more lubrication you use, the faster you can drill). Apply a low pressure on the drill, the best way is to let the weight of the drill itself and the drill bit do the work. 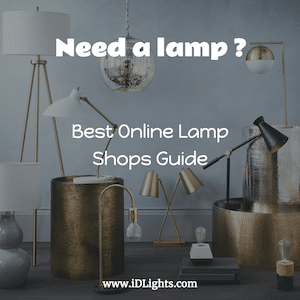 We will not go deeply about “how to wire a lamp fitting“, there are a lot of tutorials on Youtube, you will see that it’s easier than you think. Once done, pull the cable back through the hole (with the grommet) to take out as much free play as possible, and push the lamp fitting in. If you want a desk lamp without a shade, you should buy a strand of Christmas string lights, there are a lot on the web, you just have to check that the hole you drilled is big enough to feed the bottle with the garland. An old or recycled glass bottle. Sink filled with cold water. Electrical equipment: Electrical wire of your choice (colored one for example), lamp cord set with plug. First step: You will need to cut the bottom part of your glass bottle. There is a nice tutorial for that, takes only a few minutes! Run the end of the cord set through the bottle and through the ring in the socket. Be sure to tie a knot in the cord so the weight of the light fixture is not on the electrical attachment. Place the cord’s metal end (strip plastic, if necessary) under the screws on the socket and tighten down. Place bulb in the socket and test. You’re done! Do you like this guide? any comments? 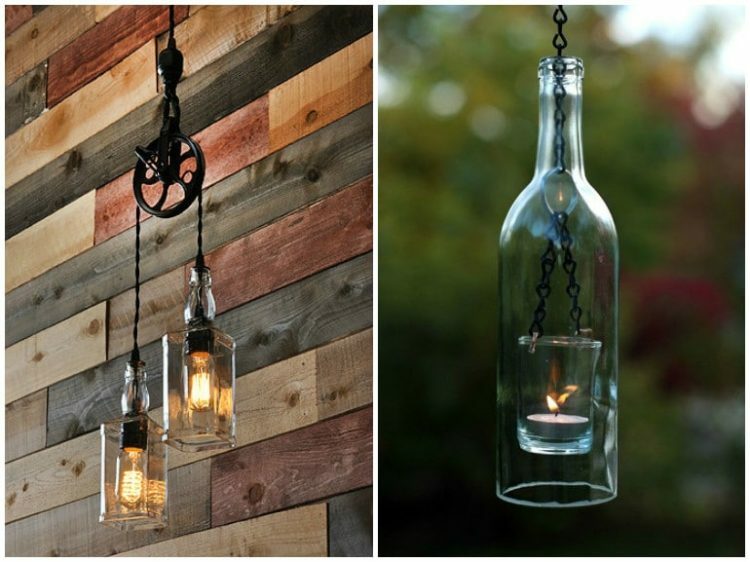 I like recycle and upcycle diy projects always!